The project creates a large-scale interactive projection, where the breathing pattern of a participant generates a landscape for a virtual character to move. People can participate in the projection by wearing a wireless breath rate-monitoring belt around their chest. The belt is given to one person at a time and he/she can walk freely in front of the projection area, while producing an undulating landscape in real time via the Bluetooth modem. The principle of visualisation of the breathing pattern is simple. Inhaling creates rising contours and exhaling descending contours on the landscape. When idle, we see a flatland, which immediately flows when the belt is in use. The breath generated landscape carries a lonely character that moves along the slopes and hills created through the inhale/exhale pattern. Instead of being identified with the character, the participant creates the condition for his journey. The surface of contemporary city space is hard, reflecting and continuously alternating. Made of steel, glass, stone and concrete, it suppresses the vulnerable human communication. Air hunger transforms a private and invisible bodily function into monumental transmission. The intimate and fragile dimensions overcome the concrete environment for a moment. Hanna Haaslahti is a media artist whose artworks challenge expectations of representation and control. Her interactive installations and films have been presented internationally. She has received the AVEK Media art award (2005) and the Honorary Mention at Vida 6.0 Art and Artificial Life awards (2003). 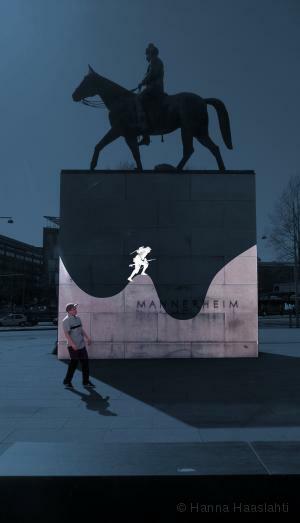 The piece is produced for the Media Facades 2010 festival by Fantomatico and realised in collaboration with software designer Jani Turunen and fashion designer Tuula Pöyhönen.